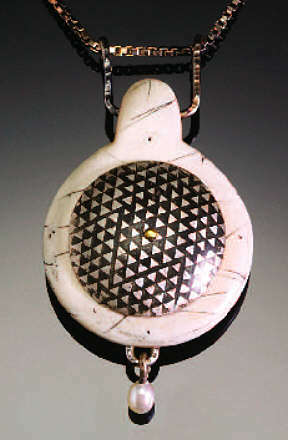 Robert Dancik has been an artist and teacher for more than 30 years. He teaches workshops at art centers in the US and abroad and his work is found in numerous collections. He is a partner in the gallery “zoe & floyd” in Seymour, Connecticut, near his home in Oxford, where he is an avid cook and collector of toys, maps, and compasses. The malleability of PMC in its wet state makes it easy to form, mold, and connect. After firing I have found the resulting fine silver pieces (which are fully annealed) just as malleable, although in a different way. It is easy to forget that when we remove PMC from the kiln, what we have is a piece of metal and we can bring to bear on that piece any and all of the myriad techniques employed in “regular” metalworking. (Or sculpture or collage or printmaking, for that matter.) This does not mean we need a host of tools or an elaborate workshop. With our standard PMC tools and not much more than an additional file, hammer, and a drill, we can incorporate other materials into our PMC and our PMC into other materials. The other material I am using for this project is Faux one®, a PVC product that is easy to use, extraordinarily durable, inexpensive, and safe. 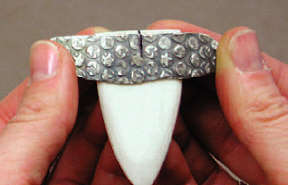 It can be hammered, filed, sanded, polished, heated, molded, drilled, and carved. The PMC can be pushed around or into it and it is so tough you can hammer on it, which I do in the project presented here. For this project I have sawn the Faux Bone®, filed, sanded, and polished it (all by hand — it’s quick work), and then riveted on a fired strip of PMC. Two eye pins and a chain and you’re done! On a prepared texture sheet, roll out a 5-card-thick strip of PMC that, when fired, will yield a strip approximately 21⁄2″ long and 5⁄8″ wide. (With Original PMC, you will need a strip 31⁄4″ x 1″, for PMC+ a strip 3″x 7⁄8″, and for PMC 3 a strip 23⁄4″x 3⁄4″.) If you prefer, you can roll out the strip on a flat surface and texture by stamping from the front, or texture after firing. Fire the strip using a standard firing. For PMC+ or PMC3, I recommend a two-hour firing to increase the malleability and strength after firing. 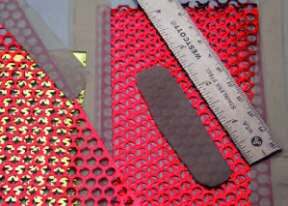 Note: Silicon carbide (Wet or Dry) sandpaper, used in the next step, is designed to be used with water. So before filing, cut a 2″ x3″ piece of each of the grits of silicon carbide sandpaper and place them in a cup of water to soak. Beginning with 320 grit silicon carbide sandpaper, sand the piece thoroughly, including the flat top. e sure to sand out all the file marks. Finish the sanding process by progressing through the 400 grit and 600 grit sandpapers, rinsing the piece after each sanding. To impart an even smoother, polished finish, turn the 600 grit sandpaper over and rub the piece briskly with the back of the sandpaper. Rub the piece in the palm of your hand and then briskly on a soft, clean cloth, and you will see a soft sheen appear on the piece. Finishing the Faux one® includes an almost infinite number of possibilities. 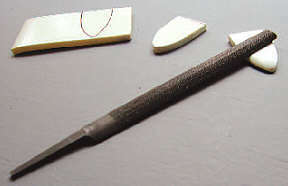 It is so durable that it can be stamped with metal or leather stamps; scratched with tools, sandpaper, or electric engravers; carved with burs, files, grinding wheels, or chisels; or embossed after gentle heating. It can also be drilled and sawn, and inlaid with epoxy or other materials. For this piece, I scratched the surface and rubbed with acrylic paint. When the PMC strip is cool, refine the shape with files, a jeweler’s saw, or any other means you choose. Sand the strip and finish as you like. 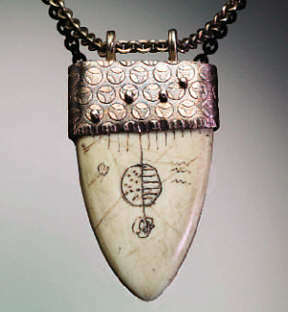 For this project, I oxidized the piece in liver of sulfur, brass brushed it, and burnished all edges and high spots. Pick the piece up, hold the strip and tongue with thumb and forefinger, and bend one end of the strip around the side onto the back of the tongue. Repeat for the other side. The silver should fit snugly around the tongue. If it is loose or uneven, tap it lightly with the mallet until it fits tightly. Look at your piece from the front, and decide where you want the rivets to be placed. The rivets must go through the front of the strip and the tongue, and come out somewhere near the ends of the strip in the back of the piece. Mark where the rivets will go. Do not drill any holes yet! Cut the 16 gauge wire into two 1″ pieces. File one end of each wire flat and square, and remove the slight burr around the filed end. Make sure the silver is positioned where you want it on the tongue. 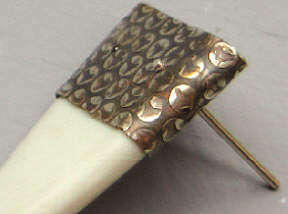 Use an awl or center punch to press (not hit) a small dent into the silver where the first hole will be drilled. Working on a scrap of wood, and starting in the dent you made, use a #55 drill bit to drill one hole through the silver, the tongue, and the back of the silver. 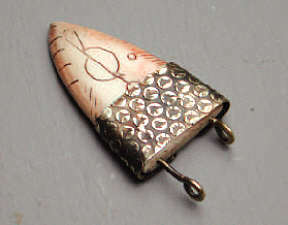 Continue hammering around the rivet wire until you have formed a low dome. The goal is to form a rounded rivet head rather than hammering the end of the wire flat. Turn the piece over and repeat for the other end of the rivet. The only difference in this step is that you needn’t leave any space beneath the piece. Repeat steps 12 through 15 for the other rivet. 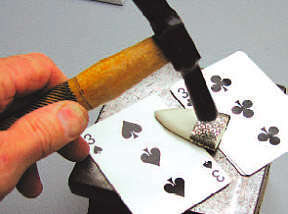 Hammer the other 2″ piece of 14 gauge wire with a metal hammer to impart a slight texture. Using the round nose pliers, form a 1⁄4″ “eye” at each end of the wire. Cut the wire in half, yielding two eye pins. Oxidize to match the silver strip. On the flat top of the tongue, drill a #52 hole 1⁄4″ from each end along the centerline of the flat top. Hang your piece on a chain and enjoy.